Planning to BUY A PROPERTY? Well, get ready for a major paperwork as the process involves providing (to authorities and the bank in case you are taking a home loan) and acquiring several documents (this ensures your ownership over the property). This is the most important piece of paper required for property purchase. SALE DEED has to be produced in original as it establishes the ownership of title of the property. You need to register the sale DEED in the Sub- Registrar’s Office of the area where the property is located. 2. Khata certificate / Extracts..! Khata certificate or extract is known by different names in different states and is an important document for the REGISTRATION of a new property. It is also required if you want to transfer the ownership of the property at a later stage. This document is a proof that the property has an entry in the local municipal records and the construction has been done according to an approved plan. Banks ask for this paper before granting you a home loan. This specific document is for Gram Panchayat properties and provides the details of previous ownership. Though not required in original, this is mandatory to produce if the property you are buying is in Gram Panchayat jurisdiction. 4. General Power Of Attorney..! This document is required to prove whether the sale or purchase of a particular property is being done by an authorised person on behalf of the owner of the property. This has to be produced in original for getting a housing loan. 5. Copy Of Building Plan..! A buyer must acquire a copy of the building plan approved by the statutory body to establish that the construction of the property is legal and is done according to set rules and regulations. 6. No-Objection Certificates - NOC ..! There are as many as about 20 NOCs that have to be acquired by a developer from different authorities while building a housing project. However, the number may vary according to specific state rules. Ask your developer to provide you the copies of these NOCs, and keep it in your personal record. An allotment letter is one of the most important documents required for getting a home loan. It is issued by a developer or / the housing authority, stating the description of the property and details of the amount paid by the buyer to the developer. Do keep in mind that an allotment letter is not the same as an agreement of sale. An allotment letter is issued on the letterhead of the authority while a sale agreement is documented on a stamp paper. Moreover, an allotment letter is issued to the first owner and other owners can ask for the copy of the original letter from the seller. This document lists all kind of information about the property ― the terms and conditions, the possession date, the payment plan, the specifications, the details about the common areas and facilities, etc. The agreement also holds the developer responsible for the construction of the property. 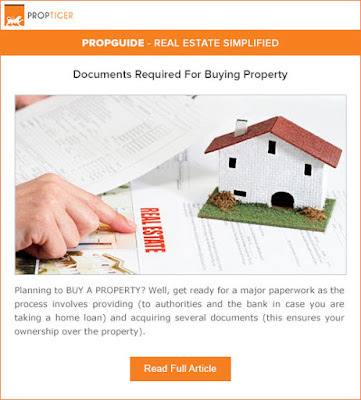 This document has to be produced in original for property purchase and acquiring home loan. This document is provided to the buyer by the developer, and sets a date on which the latter would grant the former the possession of the property. The original copy of this document has to be produced for getting a home loan. Collect original payment receipts from the developer if you are buying a new property. If you are buying a resale property, ask for a copy of receipts from the seller to be produced to the bank. Property owners have to pay taxes. Ensure that the previous occupier/owner had paid property taxes and there are no pending due. Property tax receipts also help in proving the legal status of the property. An ENCUMBRANCE CERTIFICATE is required to prove that the property does not have any pending legal dues or mortgages. This is one of the key documents banks ask for before they grant you a loan. This certificate also has all the details related to the transactions happened over a period of time. In India, a Form 15 is issued if a property has any encumbrance registered; otherwise, a Form 16 will be given to the owner, stating there are no encumbrances. This document is required for getting a home loan. This paper establishes the fact that the building is constructed according to an approved plan. An occupancy certificate is issued by the local authority to the developer to establish the building is finally ready to be occupied and the construction has been done according to a sanctioned plan.